Facilitated program topics are tailored from a subset of the Skillsoft WIA program. 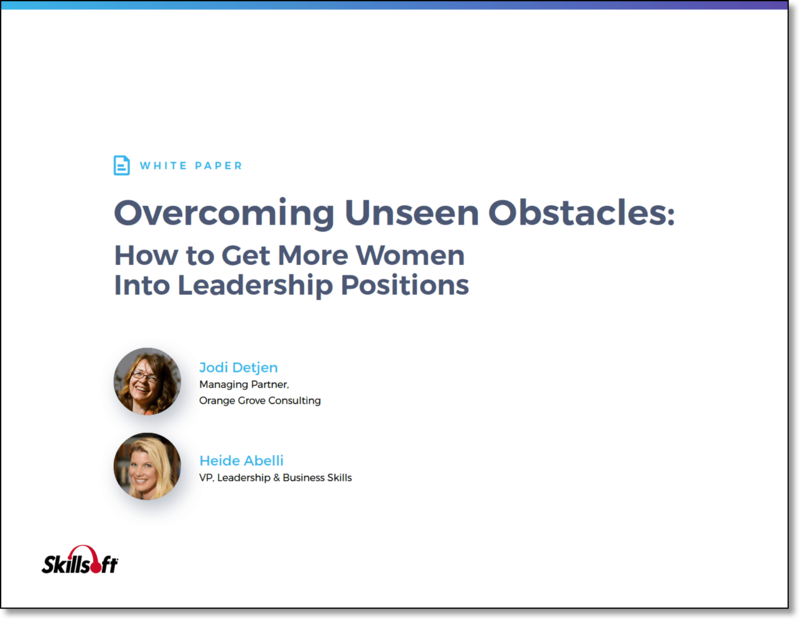 Unconscious bias is often the silent killer of women’s leadership success and continues to be one of the dominant drivers holding women back in their careers. While unconscious bias towards others is a familiar aspect of this problem, the unconscious biases women have about themselves are an invisible threat. Research has found the biases women commonly adhere to in career-making decisions typically fall into one of three basic assumptions: do it all, look good and be nice. These assumptions impact women’s career trajectory and employer’s ability to retain and promote women in the workforce. This course focuses on helping women recognize and overcome these limiting assumptions and is the cornerstone of Orange Grove’s framework. In this workshop, participants move beyond the superficial “fake it ‘til you make it” advice and dig more deeply into understanding themselves and the foundation for building value. Participants learn how to frame their accomplishments in ways that showcase the value they bring to the business and build their skills in thinking more strategically. Organizations are challenged to develop leaders who can think strategically and solve systemic problems. Yet, women are often thought to be deficient in this area, tending more often to be the “doers” rather than the strategy gurus. How can mid-level women leaders develop this capability? This workshop offers a new model that helps to shape strategic leaders using five perspective shifts that move career women into a more strategic mindset, understand their value, and increase their impact. Work-life integration remains illusive to many women. Employers are often unsure how to support work-life balance and women sometimes keep themselves small or leave altogether when work and life seem at odds. Our paradigm-shifting research provides for a third way that integrates work and life, helping women remain engaged in their careers while maximizing a robust life. Women dislike tooting the horn about their talents and accomplishments. For many, it doesn’t feel a very ladylike thing to do. However, to be promoted and retained, employers need to know what value they bring and what they have accomplished. Women struggle with risk-taking, often preferring to keep themselves small rather than fail. They under-capitalize, under-resource, and avoid high-visibility projects or roles. When they fail, women often ruminate or over-attribute root causes, rather than learning from the failure and moving forward. There are often greater social penalties for women who fail, which reinforces the problem. This “stay safe” approach can limit an organization’s growth and potential.